Ida Rentoul Outhwaite (1888 - 1960) was an Australian illustrator of children's books. She was masterful at depicting fairies and the natural world. 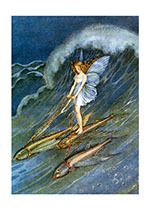 Her books include Elves and Fairies (1916), The Enchanted Forest (1921)and Blossom: A Fairy Story (1928).